Aerospace Machining Companies: Contact Global Machine Works, Inc. Contact Global Machine Works Today! For any questions or inquiries, the Global Machine Works staff is available Monday through Friday, between 8:00 a.m. and 4:00 p.m. You can fill out the form below to send us an email, or contact Sales or Quality Assurance departments directly using the email addresses below. For all sales related questions, please contact our Sales Department. 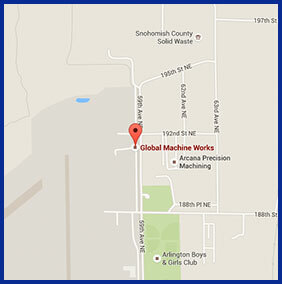 If you are a current customer of Global Machine Works, please contact our Quality Assurance team.